Oh What a Day it Was! I am guilty of being one of those people that time has a way of 'getting away' from. Well for example, here we are on Saturday morning of vacation and I am just getting to the post I have been meaning to write all week! So last Friday, when it quickly became the last day before vacation, we most certainly had a lot on the ticket for the day! In addition to what might have been my own procrastination, we had a 6th birthday to celebrate, a new library to tour and a play to perform! It was truly a busy day! We started out our morning with a birthday circle, celebrating this student's 6 trips around the sun! The children hung up the 'celebrate' banner and the birthday girl unpacked the birthday ring and put on the decorations, the number 6 and the candles. After lunch we enjoyed cupcakes for dessert. 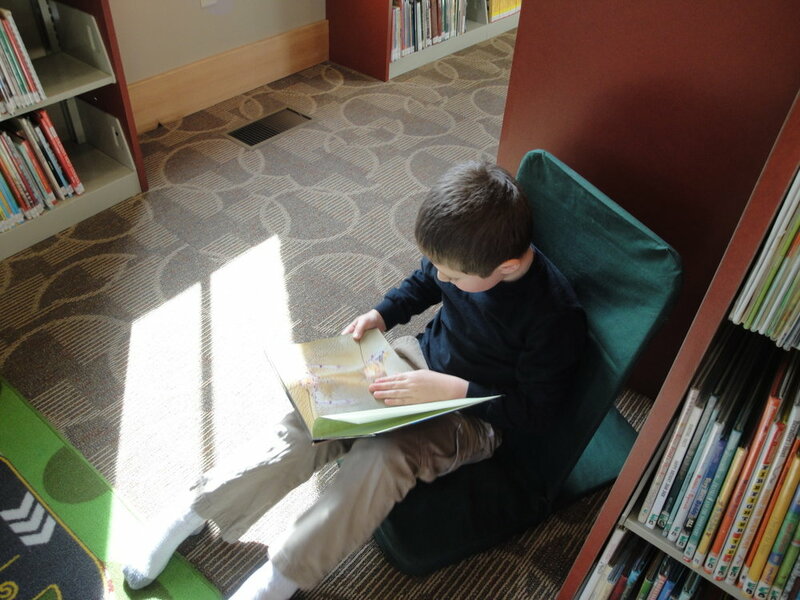 We have been so fortunate all the way through the library construction that we didn't miss any of our story time dates, but that changed when an unexpected hiccup closed the library for about two weeks. Mrs. T was able to still come over and read to us, but we were not able to check out books. So when Friday afternoon arrived, the children were just bursting at the seams to get over there and check out the children's room! The official open house was scheduled for Friday afternoon at 4, but Mrs. T was gracious enough to invite us over early for a tour, one story and some time to soak up the beauty of the new addition! The children took this very seriously, because they were planning to take their parents to the library open house after the show that was scheduled for later in the afternoon. The new addition is just beautiful! When you stand where I stand, surrounded by children with passionate parents, and look around, I only believe great things are ahead for the children of Newfound. This new library is just one piece. The space and the building are going to provide so much for the children and their families! Thank you to everyone who made this addition a reality! 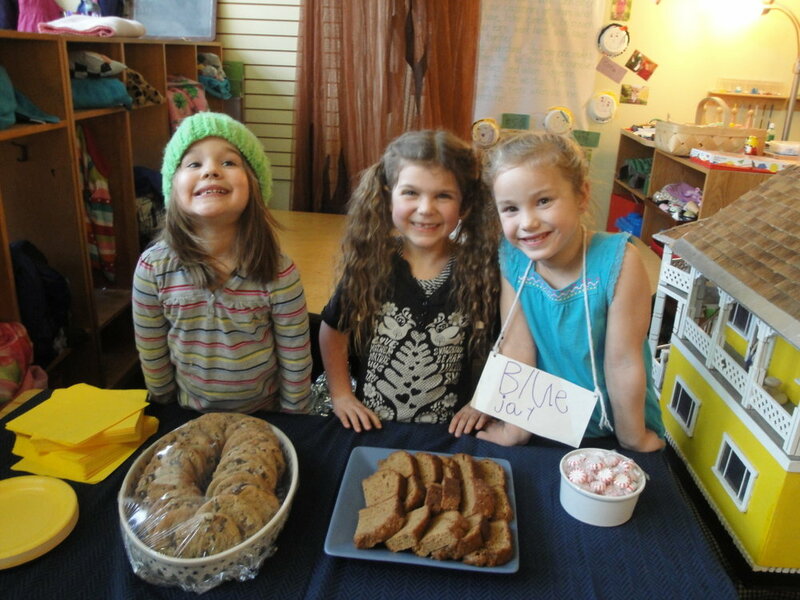 After a world wind trip to the library and some much needed gross motor time on the playground in the bright February sun, it was time to return to school and put on a show! One day, a few months ago, Mrs. Broome read Stranger in the Woods to the children, and then they performed a readers theater to go with it. That was all Mrs. Broome had planned to do with the book. Well, that wasn't all that our students had planned! They convinced her that they really should put on a full production of Stranger in the Woods and perform it for their parents. And so they did! Ticket takers! 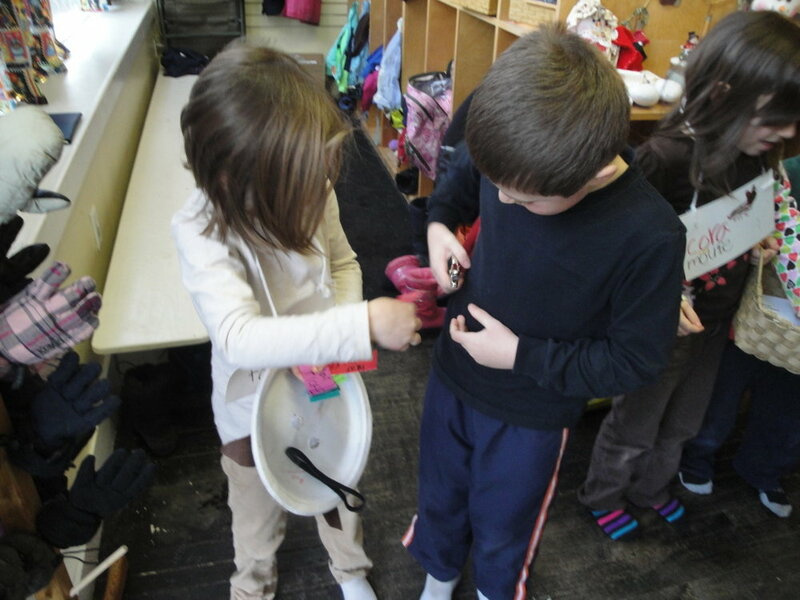 One child told another while getting ready, "Be sure to greet them with a compliment." Is it true, could there be another stanger in the woods??? So the day came to an end, and I was exhausted! The children must have been too. 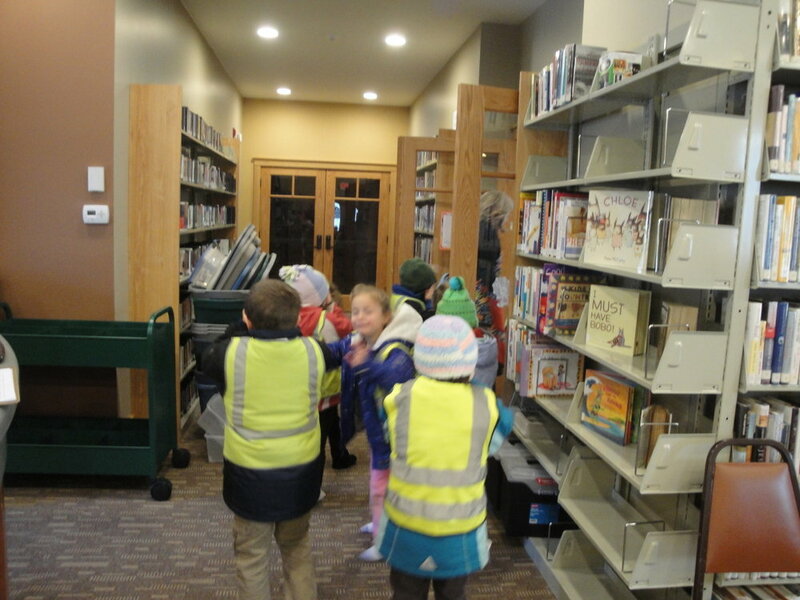 I think they must have gone home and crashed, but not before they took their parents to the library open house of course! The play was fantastic, and the children had a ball with all the roles involved with the production. A very special thank you to their stage producer, Mrs. Broome!